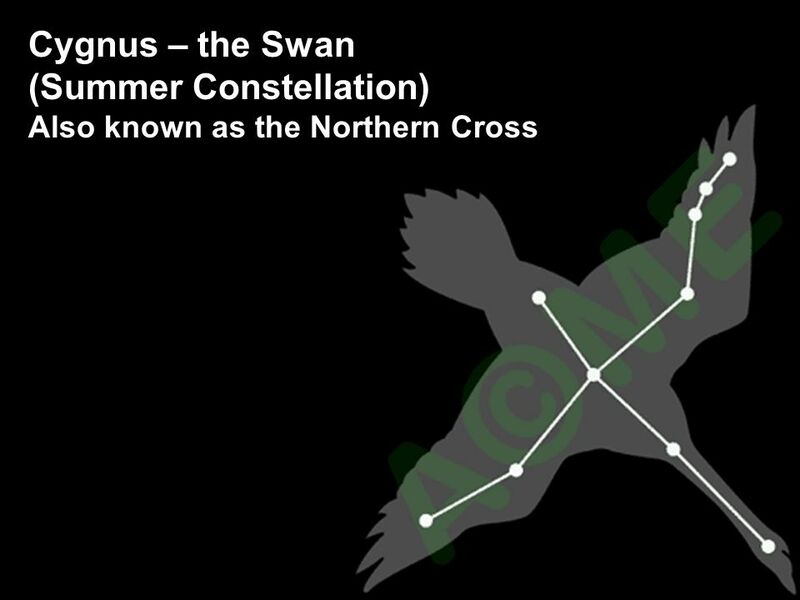 Cygnus the swan is one of the oldest constellations. When Ptolemy described it in the second century it was already ancient. There are many stories attached to Cygnus. The best known is that of the liaison between Zeus disguised as a swan and Queen Leda. The unusual outcome was Leda's giving birth to an egg. In some versions it's two eggs, with twins hatching from each: Castor and Pollux from one and Helen of Troy and her sister Clytemnestra from the other. Cygnus is one of the constellations whose shape is a plausible representation of what it represents, a swan with outstretched wings. 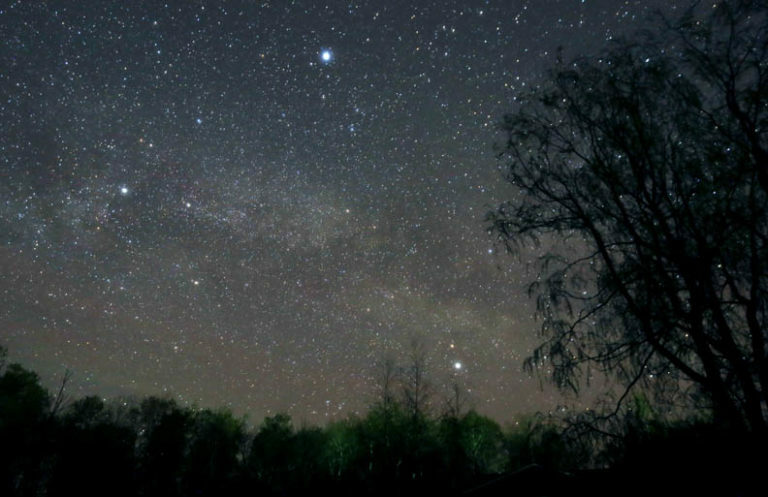 Part of the constellation is also known as the Northern Cross. 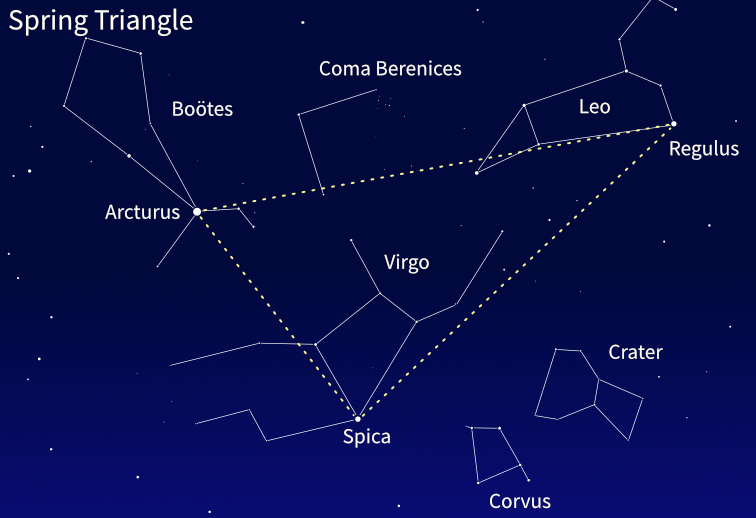 The cross is an asterism, i.e., a recognizable star group that isn't a constellation. Note that the cross is opposite in orientation to the swan. We'll begin our tour with Deneb at the top of the cross, the swan's tail. Deneb (Alpha Cygni) is a supergiant, a hot young star with a diameter a hundred times that of the Sun. Although it still looks bright to us, Deneb is so far away that its light takes some 1500 years to reach us. It's at least 50,000 times brighter than the Sun. At the foot of the cross - the swan's head - is Albireo. It's about halfway between Vega and Altair and seems to be a single star. However it is one of the most beautiful double stars in the sky. 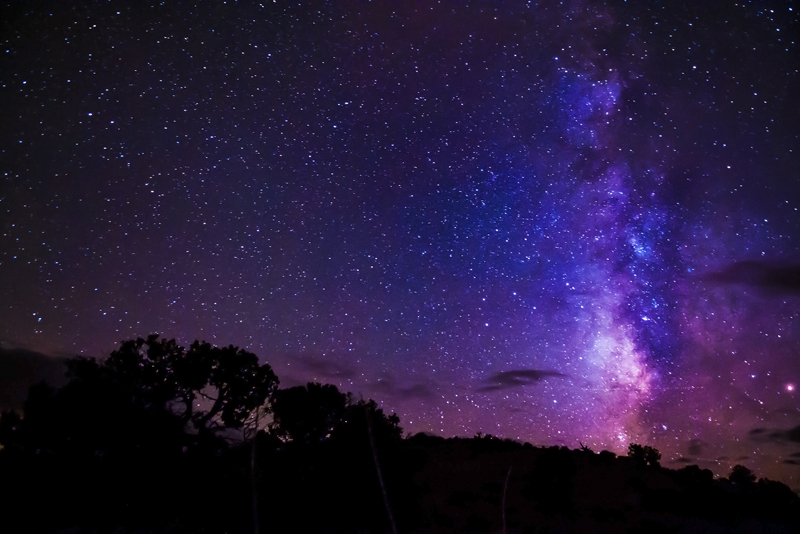 Even a small telescope can resolve it into two stars, one amber and one blue. 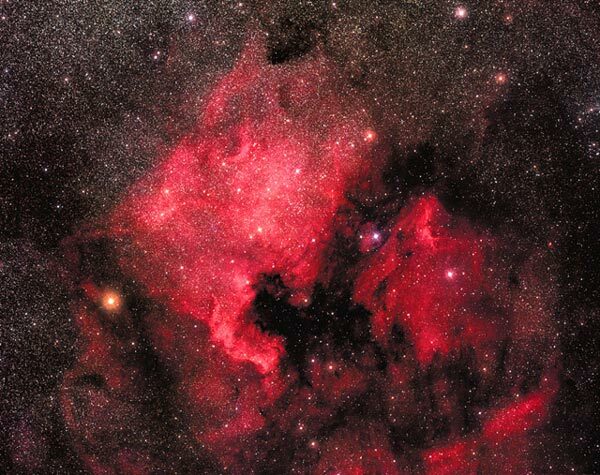 Nebulae are great clouds of gas between the stars, and Cygnus contains a number of them. One is the Veil Nebula, discovered by William Herschel in the 18th century. It's a supernova remnant, the remains of a giant star that exploded thousands of years ago. This will be Deneb's fate one day. Another nebula discovered by Herschel is NGC 7000, the North America nebula. It was just a fuzzy object in Herschel's telescope, but the reason for its nickname is quite evident in this photo of NGC 7000 taken by Jason Ware. It has a nice Gulf of Mexico, though it gets lots in the west and undefined up towards Canada. The red color shows that it's an emission nebula. An emission nebula glows because it's energized by a nearby bright star. This is common in regions where new stars are forming. Many extrasolar planets have been discovered in Cygnus, because the Kepler space telescope monitored part of the constellation. As of July 2018 it had found 2650 confirmed exoplanets and 2500 candidate exoplanets. One of the intriguing new planets 16 Cygni Bb was discovered even before Kepler went to work. The planet orbits the sunlike yellow star 16 Cygni B, which is a member of a triple star system. 16 Cygni A is another star similar to the Sun and 16 Cygni C is a red dwarf. The gravitational forces on the planet are complex, and its orbit is highly elongated. When 16 Cygni Bb is closest to its star it's about a million miles closer than Mercury is to the Sun, and scorchingly hot. Then it swings out on its long orbit to a distance that would take it into Jupiter's orbit in our Solar System. 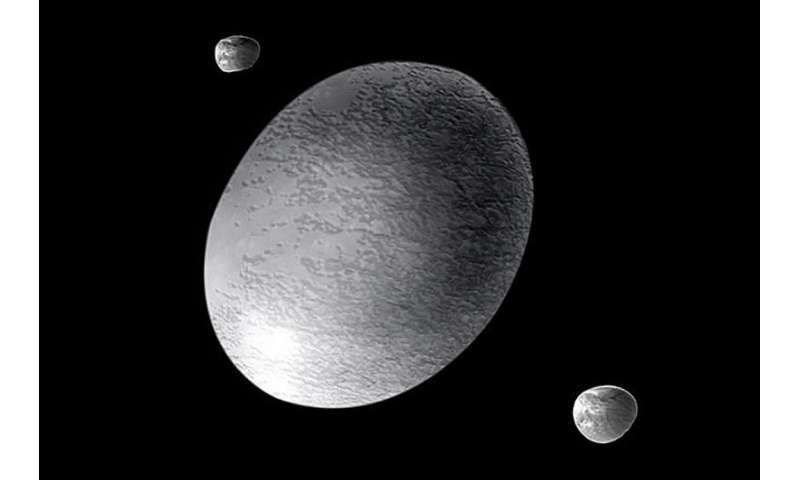 It could still have a moon where simple life forms might survive. However the planet itself, in addition to its crazy seasons, is most likely a gas giant. 16 Cygni Bb isn't quite the end of the tour, for I've saved something special for last: Cygnus X-1. It's a strong X-ray source and a dense unseen object with a mass at least eight times the mass of the Sun. A black hole. The black hole forms a binary system with a blue supergiant. They both orbit a common center of mass about once every five and a half days. The black hole's strong gravity pulls gas from its companion onto a disk of gas called an accretion disk. As matter spirals from this disk into the black hole itself, it heats up so much that high energy radiation such as X-rays and gamma rays is given off.